A new playground for the children of the Standing Buffalo Dakota Nation could also act as a way to learn and expand knowledge. Chief Rodger Redman said the new playground was built to replace the old one which was built when the school was built, about 30 years ago. Redman said the band paid for the materials while the Ahmadiyya Muslim Jama'at volunteered to build it. 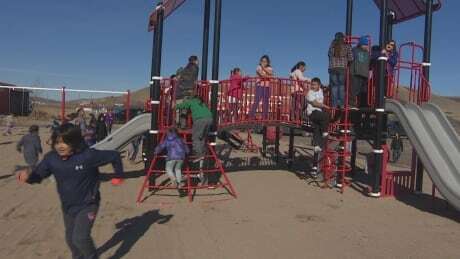 In addition to exposing the children to new cultures, the new structure is also just safer, said Noella Eagle, principal of the Standing Buffalo school where the playground was built. "We have so many similarities and differences so it's a matter of just making those connections and showing the kids that, yes we have our friends, our neighbours that can come in and make your community a better place," Eagle said. The province's Ahmadiyya Muslim Jama'at was visited by their caliph, Hazrat Mirza Masroor, Ahmad more than two years ago. He instructed them to reach out to Indigenous communities and establish a relationship. It's something the Ahmadiyya Muslim community is doing across the country, according to Imam Zeeshan Ahmed. To establish a true communion with God, then one must serve humanity, he said. Ahmed said the Ahmadiyya Muslims approached Standing Buffalo with Masroor's words in mind. "This is a message to our future generations how we can implement our words in practicality," he said. "And come out and establish bonds of understanding and bridges of harmony with each other, regardless of what background, or culture, creed, faith you belong to." More than 20 volunteers from within the province travelled to Standing Buffalo to build the playground, Ahmed said.